So naturally I decided to stage a bake off between the two cakes! In the blue corner we have the traditional chocolate cake made with eggs, butter and cocoa. In the red corner we have a vegan chocolate cake free of egg, dairy and refined sugar. It can also be gluten-free if you use gluten-free flour as stated in the the original recipe. Now as a teacher it pains me to say that I haven't exactly controlled for all of the variables in this comparison. I did remove the cayenne pepper and orange zest from the vegan cake to make it less 'mexican' and more 'plain chocolate'. But I have compared a layer cake to a standard one tier cake and one cake is iced and one is not. The photos certainly definitely favours the former each time. The ingredients in the traditional cake are all pantry and fridge staples. Nigella's recipe uses sour cream but I didn't have any and the substituted yoghurt worked well, but apart from that, all ingredients are familiar and easy to work with. The vegan cake has a far less common list of ingredients that wouldn't be regularly found in many kitchens. Luckily I had all of the ingredients except for the coconut nectar and gluten- free flour. The coconut nectar is an ingredient I had actually never heard of before, but I wasn't really surprised at the concept considering all things coconut are going crazy on the health food scene at the moment. A quick Google search revealed that honey was a suitable substitute. Some vegans wouldn't be happy with this substitution, but maple syrup or rice bran syrup could also be used. The traditional cake has a very simple method - all are added straight into the food processor and blitzed. The vegan cake has a couple more steps, mix wet into dry, but it is still a very straightforward method. Winner: Traditional cake as it uses more common ingredients and utilises a one-step method. Flour, butter, sugar and eggs are all quite cheap ingredients making the traditional cake quite economical. The vegan cake is far more expensive - coconut oil, coconut flour and raw cacao all being relatively expensive. It also uses large quantities of the cacao and honey further adding to the expense. I've learnt that vegan often doesn't mean healthy and that healthy doesn't always mean low in kilojoules, especially when coconut is involved. My prediction was that the vegan cake would be quite energy dense but much higher in micronutrients (vitamins and minerals) and fibre and I was on the mark. You can see below that energy per serve is quite similar. The coconut makes the fat content higher in the vegan cake compared to the butter in the traditional cake. The quantity of honey in the vegan cake also makes the sugar content higher than the traditional cake- and that is even with me halving the original quantity from 2 cups to 1 cup (and adding more water to keep the liquid ratio okay for the coconut flour). The added salt smashes the sodium levels in the vegan cake but it does at least have marginally more protein. The vegan cake has a heck of a lot more fibre, so should at least be better for satiety. The vegan cake is better in terms of micronutrients with better numbers for iron, Vitamin C and potassium and it has no cholesterol. Full nutritional information is at the end of the post. Winner: It will depend on your view of nutrition, but I give it the Vegan cake, especially as I think it easily serves more than 10 (which is a big call for me, I have big serves) and therefore the nutritional stats go a little further in it's favour. Clearly neither is great if you are trying to keep your kilojoule/calorie intake on the down low! The most important comparison of all! The traditional cake is just that and to be honest I'm not a huge chocolate cake fan; chocolate mud cake is more my style. But my husband, who does love chocolate cake, describes it as 'moreish, sweet and fluffy'. The vegan cake is much more dense and moist, much more like a mud cake texture. It does still have a slight 'healthified' taste; I think mostly due to the use of raw cacao and banana. I like the taste but I have turned my sugar palate way down over the last 12 months. 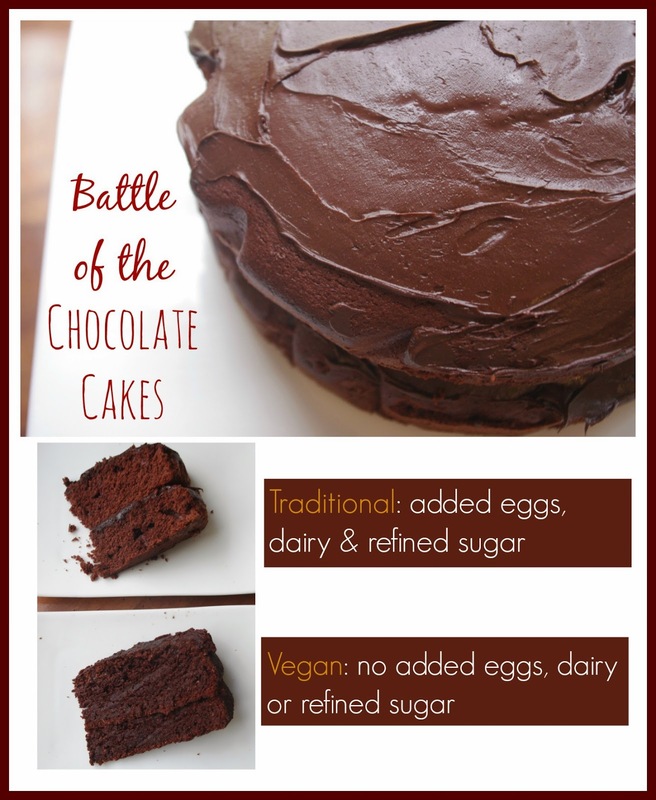 If you played this contest at a suburban BBQ, the traditional cake would win; if you played it with a bunch of healthy food bloggers I suspect the vegan cake would win! Winner: I'll call it a tie. Overall winner: As much as it pains me to say, based on my very scientific method (!? ), the traditional cake would win. But I still prefer the vegan cake, which I knew I would from the start, so maybe this has just been a pointless exercise in futility?! Oh well, it doesn’t really matter, at least it gave me an excuse to bake two cakes!! Tell me, which cake would you make?? I'm thinking the traditional cake would win for me because it's easier and cheaper and yummy!!! Also, I'm allergic to banana so that would rule the vegan cake out for me. But it's nice to know there are some very tasty alternatives these days and I enjoyed reading your comparison! Easter must be your favourite time of the year then! Happy Easter, enjoy the chocolate eggs. Yep I'm going to go traditional as well, just based on budget alone. Plus I'm not a healthy nazi, and if I'm going to eat cake, I'm going to eat cake!! !